Meeting the man of your dreams, falling in love and getting married. It sounds like every woman’s dream. But what if you suddenly found out that your husband self-identified as and wanted to become a woman? That’s exactly what happened to Connecticut-based reporter Alexandra Bogdanovic. As the daughter of music and television icons, Sonny and Cher, Chastity Bono grew up in the public eye. So it was shocking to people everywhere when she became Chaz. Her decision to “become” a man made headlines around the world, but Bono is not alone. Transgender men and women frequently appear on television talk shows and reality programs to share their stories. In doing so, they inevitably get the attention they seek; although it may not always be the kind of attention they want. While many come forth in an effort to promote tolerance, acceptance and understanding in mainstream society, their decision to live as – or in some cases have surgery to become – the opposite gender often sparks curiosity and visceral reactions born from ignorance. 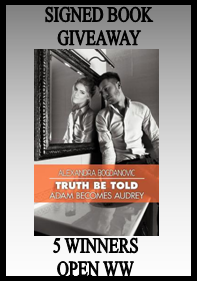 Truth Be Told: Adam Becomes Audrey, a new book from author Alexandra Bogdanovic, tells the other side of the story. Part tragedy, part comedy, part love story, the book tells the story of the author’s real life experience of meeting a man, falling in love, getting married and finding out her husband wanted to become a woman. This book is the story of what happened after she learned the truth. Alexandra Bogdanovic was born in Bronxville, N.Y. and grew up in Greenwich, Conn. She knew she wanted to be a reporter at age 12, and received her first byline in the Greenwich Time when she was a high school freshman. By the time she graduated from the Convent of the Sacred Heart in 1987, she'd been covering high school sports for a daily newspaper for four years. In 1991, Bogdanovic graduated from Manhattanville College in Purchase, N.Y., with a Bachelor of Arts in English with a concentration in writing. She officially began her journalism career as an editorial assistant at The Advocate in Stamford, Conn., soon after graduation. 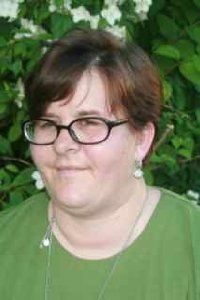 She then decided to devote her efforts to community journalism in order to have a more direct and meaningful impact in the towns and villages where she worked. One of her greatest challenges while working in Rye was covering the mutual aid response and local reaction to the Terrorist Attacks of September 11. The veteran reporter is now a freelance writer. She enjoys spending her free time with family and friends, chilling with her cat, Eli and watching and photographing high-goal polo.